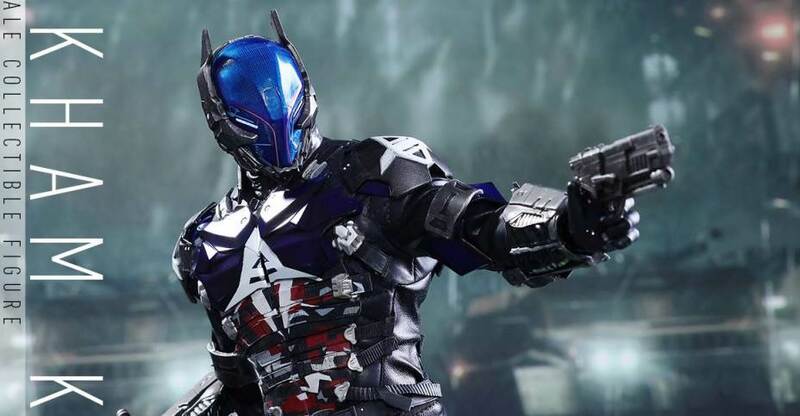 The Arkham Knight game series figures aren’t done just yet! The last of the most recent wave was held back for a bit, and it’s finally trickling out to all retailers now. That figure is none other than Red Hood 1.0. The figure is a mash up of the Arkham Knight figure and the Red Hood 2.0 figure released as a Game Stop exclusive early on in the run. More are planned (see here and here) so the 7 inch line with detailed paint from the game universe still has some life. Let’s take a look after the break at the journey to Red Hood, courtesy of Entertainment Earth! Related Entertainment Earth links: Arkham Knight Red Hood 1.0, DC Collectibles, DCC Action Figures, DCC Batman. Read on for the photos. They come courtesy of Itakon.it and ToyznHobby. These are due in January. Take a spin of the booth by checking out a full gallery of images after the jump! SQUARE ENIX’S 2015 NEW YORK COMIC CON EXCLUSIVE! A symbolic letter “A” emblazoned on his chest, mechanical armor, army fatigues – this figure shows off a wide range of different realistic textures. During sculpting we paid special attention to keeping a sharp silhouette all around. His helmet, that looks very similar to that of the BATMAN, has a translucent visor. There are two interchangeable helmet pieces: one to recreate his default appearance, and a second one painted so as to give off a glowing eye effect. Other accessories include: a sniper rifle, two handguns, and three interchangeable hands to allow for a variety of action poses. In this New York Comic Con 2015 Exclusive limited color version, we have highlighted the fine details with metallic paintwork in bright blue and burnished silver. NYCC exclusive preordered at the SQUARE ENIX Online Store will be shipped to your provided address, and are not available for onsite pick-up at NYCC 2015. Products will not be shipped November 30th, 2015. See the photos after the jump. You can pre-order it by Clicking Here. DC Collectibles is set to finally drop the Arkham Knight line’s Arkham Knight after a snafu earlier in the year where a limited amount of the figure got released. He was originally slated for Wave 1 (his box still says #2 on the side) and should be hitting retailers “officially” soon. The figure is based on the game and fits in line with the previous releases. Future figures are also planned with Wave 2 and more Gamestop exclusives. Check out our gallery of the Arkham Knight in action after the break! In the Batman: Arkham Knight video game, Batman must face off against an enemy that knows him better than any before. The Arkham Knight is able to predict nearly every move Batman makes, and knows seemingly everything there is to know about Batman and his allies. 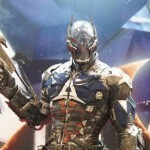 Now Prime 1 Studio brings us a new statue based on the Arkham Knight. There will be two versions, one standard edition and the other an exclusive edition. If you have not yet finished the game, and want to stay spoiler free, it may be best to stop reading now. The exclusive version of the statue features a large SPOILER for the game. Read on at your own risk. For everyone else, check out much more info and enjoy over 40 photos showing both editions.